This week in the US, at least two children have died after being shot by other children. 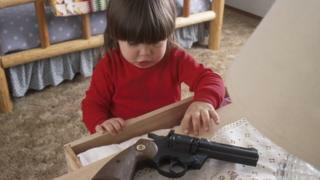 For American parents, questions of gun safety are starting to become de rigueur for potential playdates. When my son was four months old and it was time to return to work, my husband and I were hoping to meet a nearby couple to split the cost of full-time childcare. After a few fits and starts, we were finally having dinner with a nice family down the road. Their son was born a day before ours, their schedules were compatible, their expectations similar. As dinner turned into coffee, things were looking positive. There was just one last issue. "Listen," I said. "Just so you know, we, uh, don't own guns." A look of relief flooded over the mother's face. "Us neither!" she reassured me. It was the first time I had to bring up guns in the name of keeping my son safe, but it wouldn't be the last. My son is two now, and thus far has had very few instances where he goes over to a friend's home without me or my husband. But it has always been my plan to ask the parents of potential playdates about the status of weapons in their house. It feels too risky to do otherwise - almost every week in the US there are stories of children shot accidentally while playing with a gun they didn't know was loaded, or stumbling across a pistol shoved into a drawer. Once, I brought up the gun question to a mother who offered to let my son stay at her place. It was awkward. She said no but was clearly shocked that I even had to ask. Another time, my son had been invited to a birthday party at a neighbourhood home. We had neglected to RSVP on time and after sending a guilty email asking whether we could add our child and his nanny to their already packed guest list, I was too embarrassed to bring up guns. That seemed like a question for a more put-together mother, the kind who responds on time and buys a gift rather than repackaging something from the toy box. I told myself that we live in a fairly liberal enclave of Washington, a city where gun laws are strict. But I still felt like I failed at what should be a basic and simple task. To my international colleagues, this seems outlandish. But for some American parents, it's a matter of course. "I always ask two questions: do you have a loaded gun in the house and do you have Internet filters," says Kate Lacroix, a mother of an 11-year old girl. "The responses I get are pretty interesting. But most people say they have never had anyone ask them this before." On a few occasions families have answered in the affirmative, in which case she follows up by asking whether the guns are loaded and where they are stored. Every time, she says, her daughter is mortified. She, like other parents who are diligent about asking, say they have never been asked themselves. So while there is a vocal contingent of parents who think this is a good idea, it's hardly a national trend. It's also hard to know whether the questions keeps children safe or just makes parents feel more in control. Am I really protecting my son or just being a helicopter parent? I can at least take solace in the fact that my gun-owning friends are just as rigorous, if not more. An avid hunter who lives in the country told me it came up at every interview for an in-home day care for his twins. He did not want to give his name because he did not want people to know he stored guns in his home. "A 'yes' answer would not have been a deal breaker, but I would have demanded to know how the firearms were secured, with the only acceptable answer being locked in a safe, the only way in which my firearms are stored and the only manner I deem acceptable for any home where there may be children," he wrote in an email. My friend Adam Weinstein is an editor with The Trace, a non-profit investigative news site that focuses on gun policy. He's also a gun owner and father of a toddler. "I have an unfair advantage over a lot of parents trying to raise the subject; with one friend, I even ended up recommending a trigger lock I like as an additional safety measure," he says. "It's a sensitive situation, because most gun people don't want to advertise how they're armed, especially in their own home, and everybody tends to think they're the safest, smartest parent or gun owner. You try to keep it pretty vague and casual," he says. Indeed - implicit in the question is a lot of judgment: do you own a gun, which is a charged question itself in the US. Do you keep your gun safe? Do you know what you're doing? Are you a threat to my child? These are not easy questions - especially, as some friends have confided, when the gun owners are members of their own family. But in a country where one in three Americans own firearms - and there are more guns than people - being embarrassed is easier than imagining a worst-case scenario. "I'll be the weird mom who asks it," says my friend Farnoosh Torabi. "If it's awkward for the other parent, then I suppose they haven't been tuning into what's going on in the world."